Hollywood Studios is going through lots of big changes lately. Toy Story Land opened over the summer and the new Star Wars area and Mickey Mouse ride are both slated to open soon enough. That said, those aren’t the only changes. One thing that has been switched up but hasn’t gotten much press is the Disney Junior show that lives near Star Wars Launch Bay. This show used to be a fun puppet performance called “Disney Junior Live On Stage”. 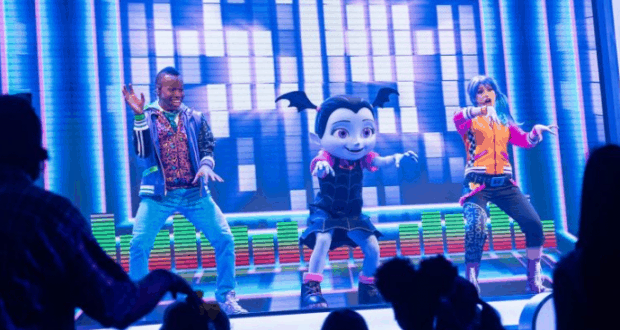 However, in December 2018, the show was changed to be a super fun performance called “Disney Junior Dance Party”. Here are 8 things we love about this show and what we know you will love as well. One of Hollywood Studio’s biggest downfalls is the fact that there isn’t much for the younger crowd to do there. Sure, Toy Story Land has helped with this a bit by giving us the Alien Swirling Saucers ride, and “Voyage of the Little Mermaid” and “Beauty and the Beast” are fun for little ones, but those things alone aren’t nearly enough to fill a day. “Disney Junior Dance Party” gives little guests something else to do that is just for them, something that makes both kids and their parents happy. This show is awesome because it features songs we know and love from those beloved Disney Junior shows alongside new and exciting dance tunes. Every song is completely kid appropriate, while still being upbeat and perfect for dancing. You’re sure to leave tapping your feet and singing these songs all day long. One of the most fun things about “Disney Junior Live On Stage” was the scene that included bubbles falling from the ceiling. If you and your children were a fan of this scene, don’t worry, it isn’t gone. There are plenty of bubbles to catch in this new show, and the kids absolutely adore it! Obviously, no Disney Junior show is complete without some favorite Disney Junior characters. Therefore, you can definitely count on seeing some of your kids’ best Disney friends. Wondering which ones you should expect? Timon, Vampirina, Doc McStuffins, and of course, Mickey Mouse all make appearances. Something that makes this show stand out from the rest is that it is very interactive. The show hosts encourage children to try new dance moves and even give them opportunities to help move the party along by helping play the music and make a special phone call. This is one of the most interactive shows in Disney, making it just perfect for youngsters. Dancing is, of course, a big part of this performance (hence the name). You can expect to learn a few new dance moves, but there are also tons of opportunities for freestyle dancing. For kids who are often cooped up in strollers all day in the parks, this is a welcome opportunity to get up and stretch. Along with the live characters that appear onstage, this show also contains plenty of awesome cartoon clips. These clips feature many Disney Junior shows and are sure to capture the attention of all the young Disney fans in the audience. Some of the clips were even made exclusively for this show, meaning you have to attend a performance to see them. Last but not least, we love the new friends that are introduced in this show. DJ Dee-Jay and Finn Fiesta are amazing, energetic hosts that are just perfect for a show aimed at toddlers, preschoolers, and young elementary aged kids. They keep things moving quickly while still making it clear what is going on, and they’re so animated that it’s hard to keep your eyes off of them, something that is ideal for little ones with short attention spans. All in all, we have to say that we really enjoy this new Hollywood Studios show. Check it out the next time you’re in the park and see what you and your young Disney-goers think of it. We think you’ll adore it just as much as we did!